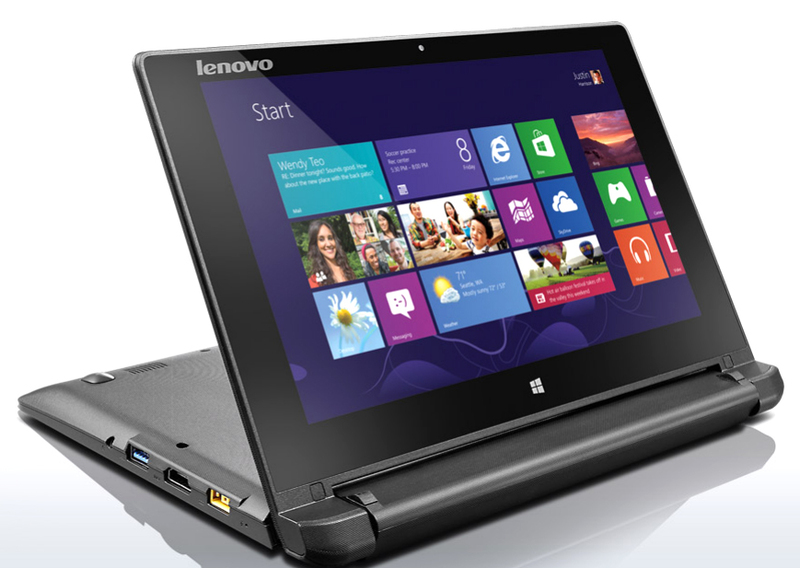 The Lenovo Flex 10 brings with it a design theme we first saw in 2012 with the original Lenovo Yoga. 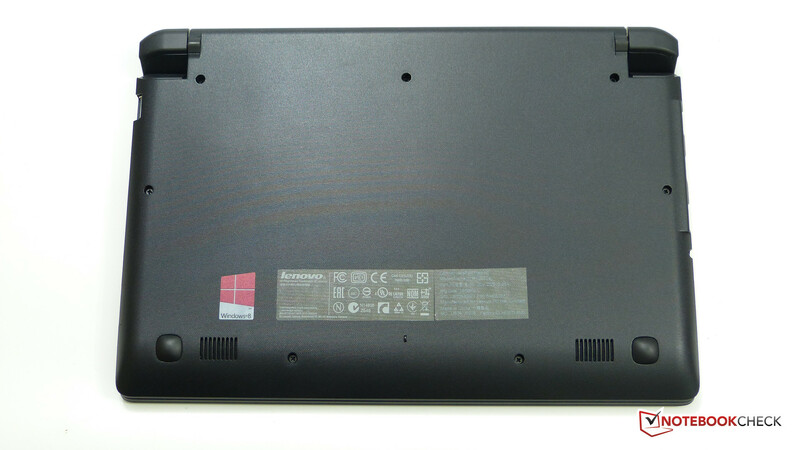 Since then the design has been brought to the mainstream laptop market with the Lenovo Yoga 2 11 and also, in a modified form, to the Flex range that we first saw last year at IFA. 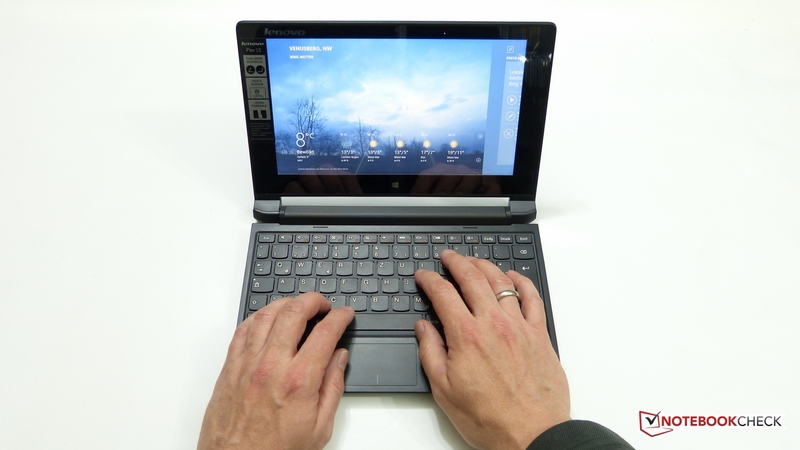 Back then the range started at 11-inch and used Ultrabook-style platforms to offer a mainstream PC experience. 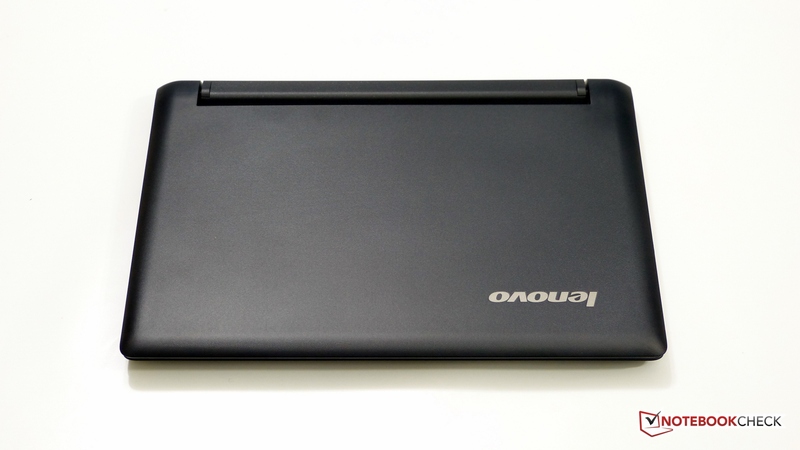 With the Ideapad Flex 10, Lenovo has taken the fold-back screen design to the budget sector where it seems to fit well as a modern netbook. That screen is important though because the Flex 10 has competitors now that netbooks didn’t have 4 years ago - tablets. 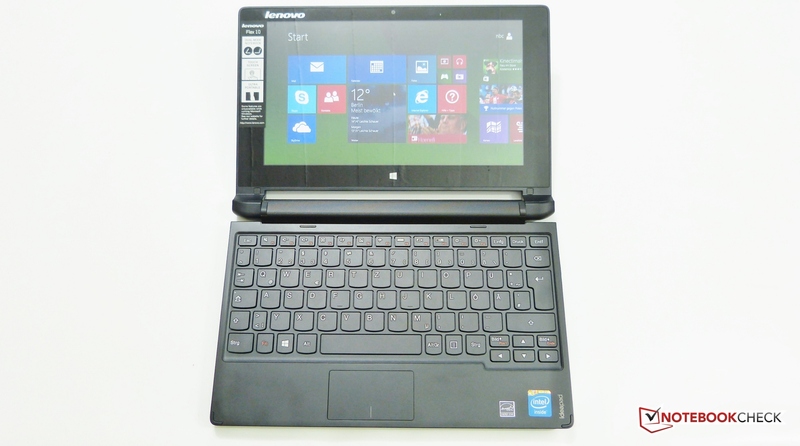 We’ve got the 320GB Ideapad Flex 10 hard-drive version here with 2GB RAM and the Intel Celeron N2806 dual-core ‘Baytrail-M.’ The system is completely fanless but the fold-back touchscreen is the highlight. Read-on for a full and detailed review and performance test. Out of the box you’ve got an exceptionally small and light laptop which feels like it could be a netbook from 4 years ago. Plastics feel a little hard, style is a little bland and there’s nothing else in the box that might get you excited. A brief look at the ports reveals the USB 3.0 port which is the first indication that it didn’t get designed in 2010! When you open up the Flex 10 up though you get the first taste of a 2-in-1 style touchscreen that, if you’re familiar with Windows 8, creates a little excitement but if you’re a Windows 7 user you may wonder why the touchscreen and fold-back hinge is there at all. Overall, the unboxing experience is going to be either a ‘cool’ or ‘why’ experience depending on your current Windows usage, experience and knowledge. Before we go into a detailed look around the device, let’s give you an idea of the stand-out features here. 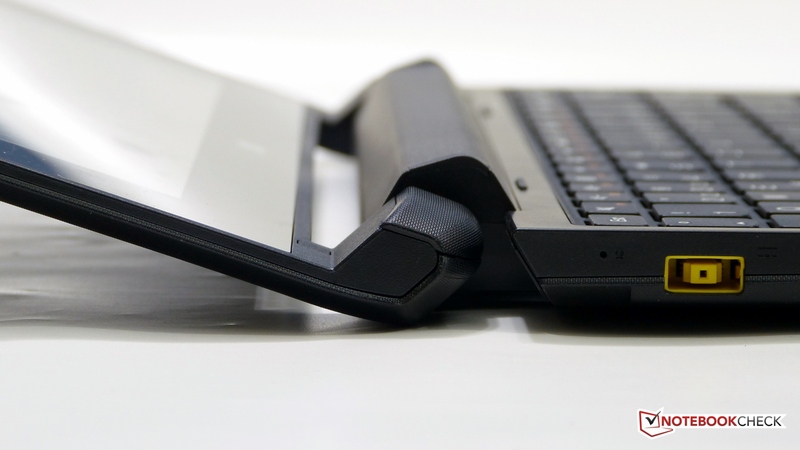 Fold-back hinge - This isn't quite a 360-degree hinge so you won’t be able to pick the Lenovo Flex 10 up like a tablet but you will be able to use it in an entertainment-focused 'stand' mode when folded back 270 degrees. 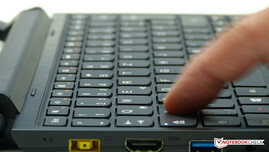 A touchscreen allows the user to control the Windows 8 UI completely mouse-less and keyboard-less, as long as you don’t stray into desktop mode. Fanless design. Only the hard drive will make any noise. 1.2KG weight and small size makes this a portable unit. Low cost. At street price of around $320 this is in the same price category as a basic Chromebook, Android tablet or 8-inch Windows tablet. A USB3.0 port allows external USB3.0 screen docking stations to be used. Note that Lenovo list four CPU variants ranging up to a quad-core Pentium (also Baytrail-M) but only the N2806 dual-core Celeron version is available in the US market at the time of writing. A 500GB variant may also be available. Pentium variants may have 4GB RAM. Lenovo Ideapad Flex 10 in 'tent' mode. 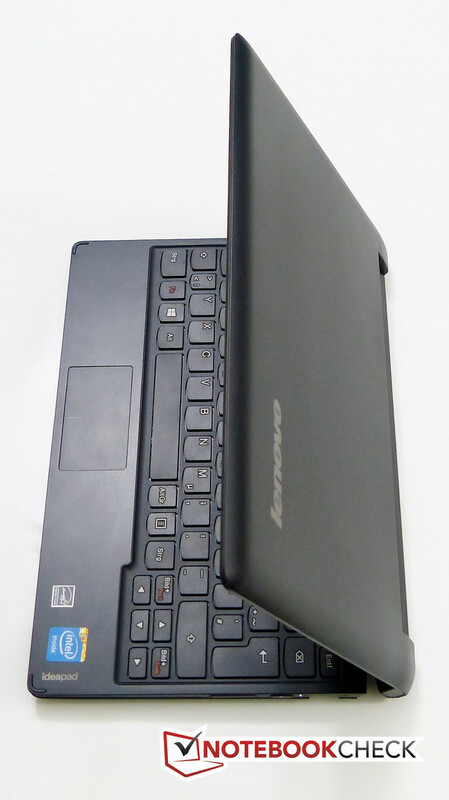 Lenovo Ideapad Flex 10 in 'stand' mode. The casing is well-built but feels somewhat cheap. You get the feeling that it’s fairly thick plastic so it could be a little more wear-resistant than other plastics and the mesh finish makes it grippy to hold and resistant to fingerprints. The all-black color is uninspiring but helps to contrast the large white key-cap printing. 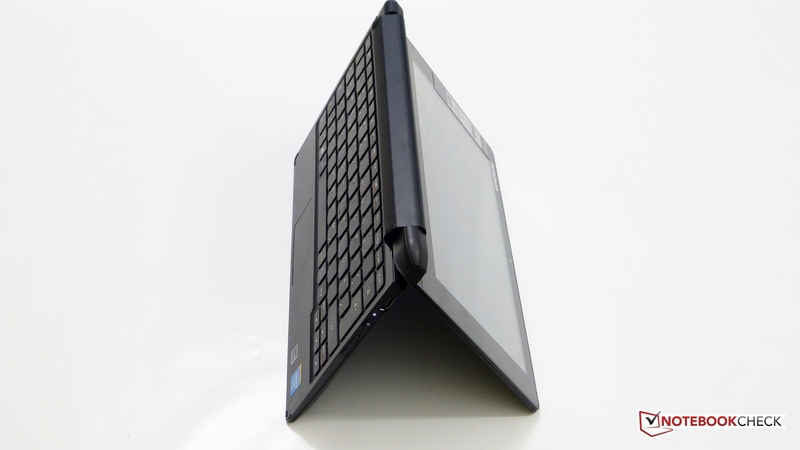 The hinge mechanism feels solid and allows the screen to rotate all the way back to a comfortable stand mode with the keyboard tucked underneath as a very solid stand. If there were a pen available with the Flex 10 this would be the mode you would use with it but it doesn't have a pen so it’s purely for finger-based ‘Modern’ Windows 8 UI usage. 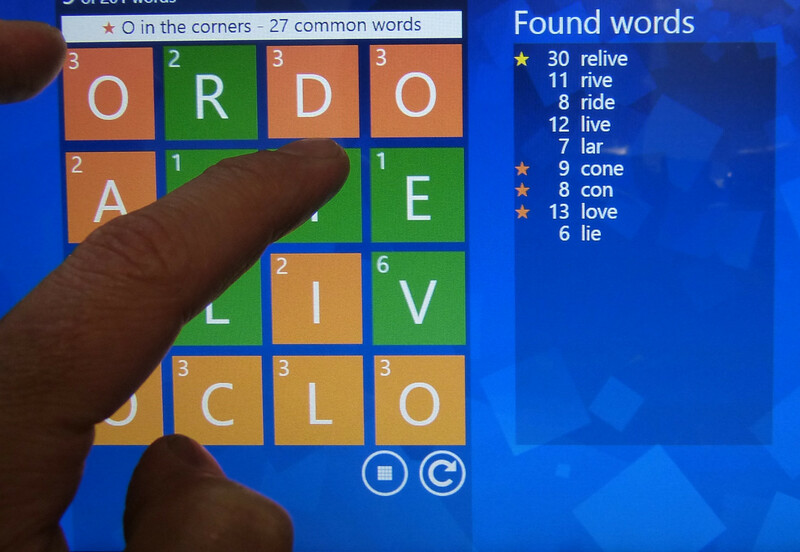 Kids will love this mode for Windows 8 gaming, education and videos. There’s very little flex and no creaking in the casing indicating again that it’s well put together with low tolerances and a sturdy plastic. 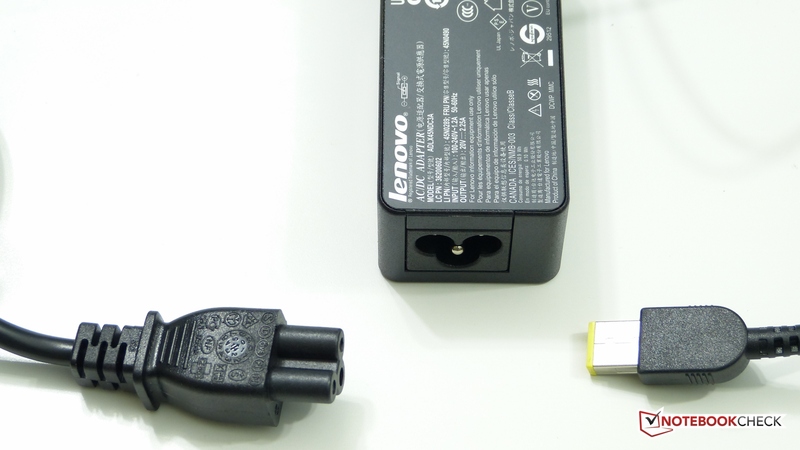 On the case you’ll find a power-on and charging lamp but no HDD activity or WiFi-on lamp. There's no disk or memory access port on the rear. 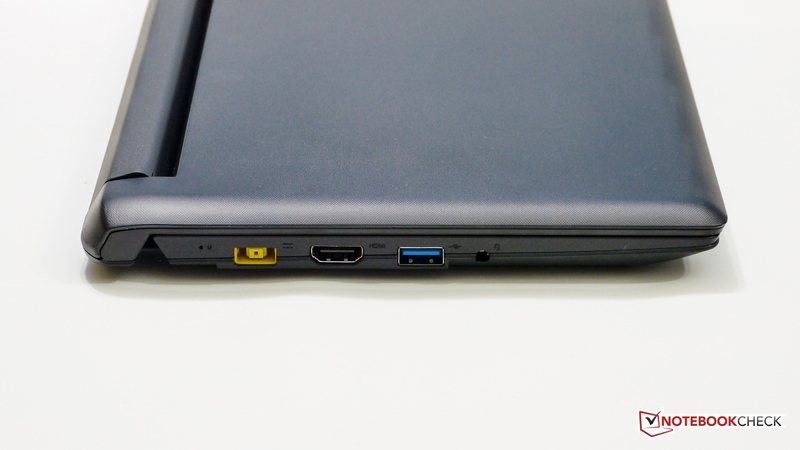 You can’t expect too many ports on such a small device but Lenovo deserve a little respect here for offering full-size HDMI and USB ports rather than micro ports that would require an adaptor. 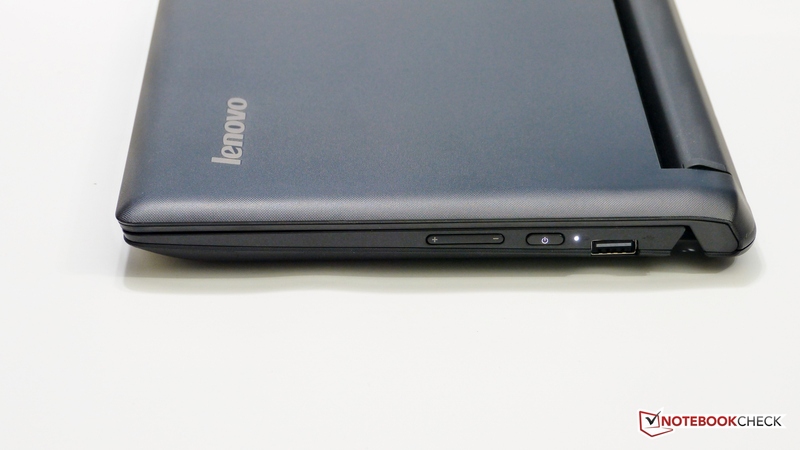 There’s no SD card slot though because Lenovo have chosen (we believe it’s a design guideline) to put the volume rocker switch on the outside for use when in stand-mode. We would have prefered to see an SD card to facilitate easy transfer of digital camera images but it’s not going to cost too much to buy a USB adaptor. A Qualcomm-Atheros AR956x offers WiFi b/g/n and Bluetooth 4.0 to the user but WiFi is only available in single-channel on the 2.4Ghz band. If you’re living in an apartment block crowded with overlapping WiFi networks then you really need to consider having 5Ghz capability. Having said that, the WiFi remained connected at 150Mbps solidly and we saw no drop-out issues during our testing period. Connection speed appeared to be average-to-good in an area two-walls away from a hotspot. 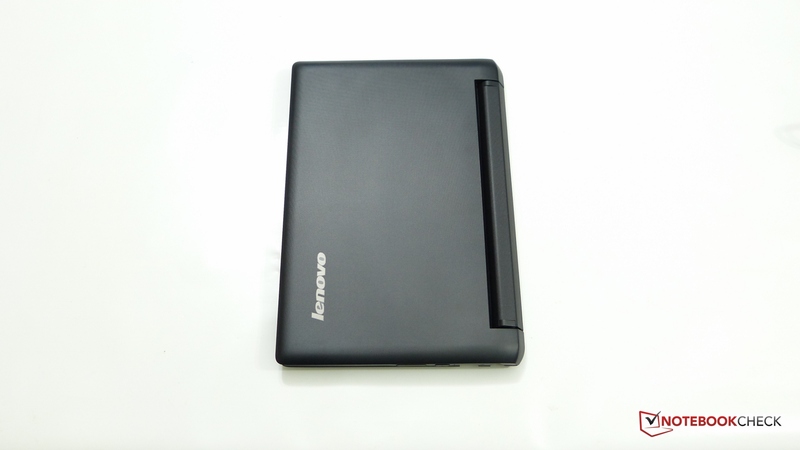 There’s no NFC and no 3G available with the Lenovo Ideapad Flex 10. 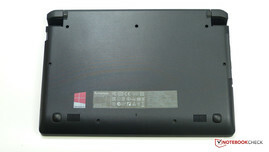 Lenovo's standard guarantee differs across countries but in general you have 1-year parts and labor guarantee. In the USA the PSU, plastic parts, keyboard and hinges are only guaranteed for 90 days. Repair is via a send-in service. 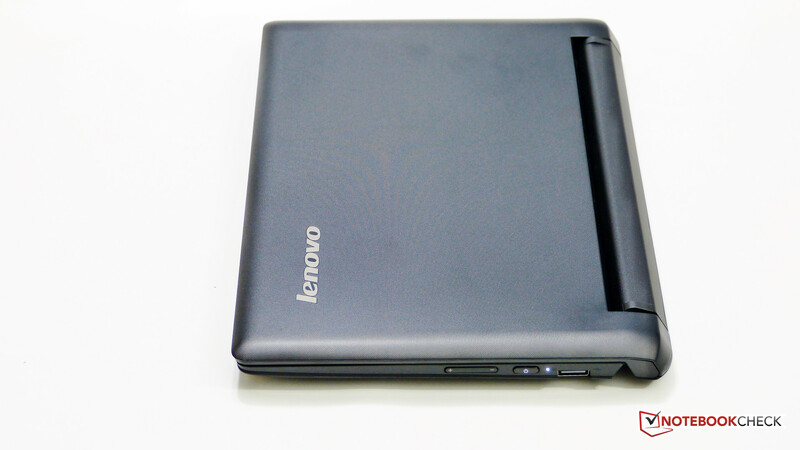 For this section it makes sense for us to write using the Lenovo Flex 10 itself so here we are, writing about one of the most important aspects of this device. Is it good enough for typing messages on Facebook, a few emails or could you write a report on it? Technically the keyboard is quite nice. There’s good ‘click’ to the keys, they don’t require any extra finger-weight (important for this light-fingered reviewer) and they’re spaced out well. We don’t like the small left shift key (on this Germany QWERTZ keyboard it must be noted) and we’d love to see a back-light and a little more travel on the keys but maybe that's asking too much at this price and size. Apart from the small size the keyboard doesn't have any surprises to it. For emailing, this is going to be fine and we’re having little trouble with this section of the review. Reversed function keys help with Windows 8 control. You can turn the screen completely off (good for an offline music mode) and you can even turn the keyboard off with one press. Flight mode, volume and screen brightness buttons are also there. 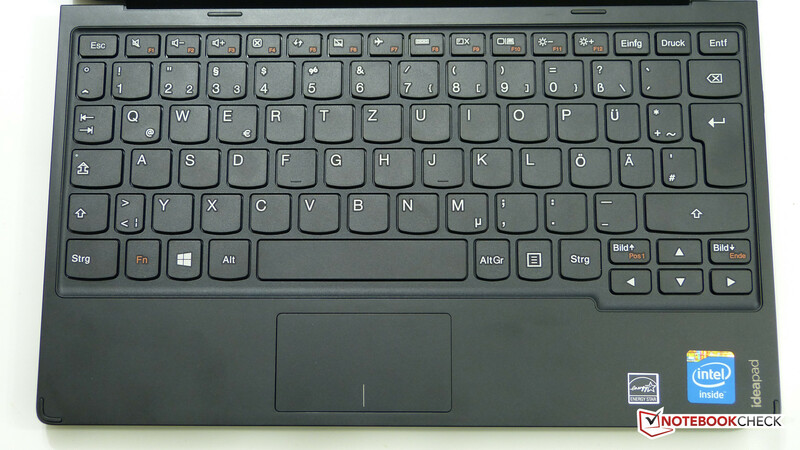 This is no journalists keyboard but it's fit for the jobs that the Flex 10 is likely to do. Moving on to the touchpad you’ll find a different story. It’s tiny and difficult to use with any accuracy. Cropping images in Windows desktop won’t be much fun. Scrolling, however, is easy with a finger on the screen, which is never more than a finger-stretch away. Multi-touch gestures are available but we couldn’t get side-swipe Windows 8 gestures to work. No worry though because that’s easier on the touchscreen itself. 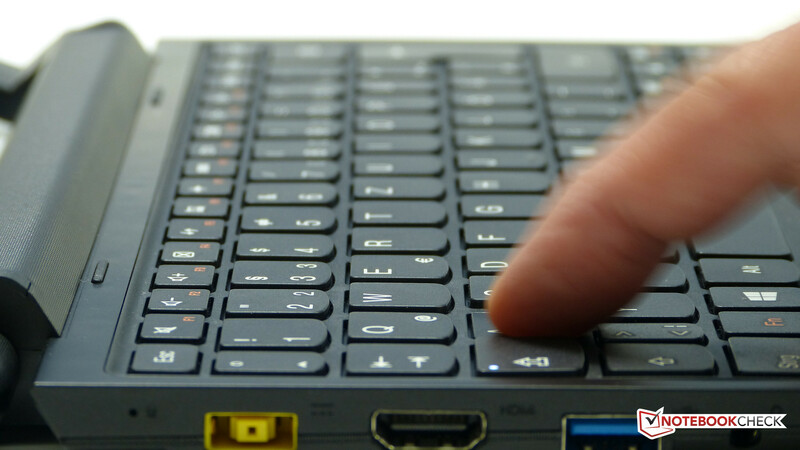 Overall you've got a keyboard and touchpad here that will work well for those that have smaller fingers and want to write a few emails or even a short report. The touchpad is just about acceptable given that there’s the touchscreen option available too. The 10.1-inch screen is not an IPS or wide-viewing angle part, has just 1366x768 resolution, isn’t very bright when working near windows and has poor color reproduction. Full test results are below but just know that this is obviously one of the areas where Lenovo have cut costs. Given that some tablets at this price are offering higher resolution and wide-viewing angles it’s a little disappointing but then again, driving lots of pixels takes CPU and GPU power and therefore impacts performance and battery life. We’ll accept the resolution on those grounds but more color and better viewing angles would have been good here. In terms of the touchscreen you have to remember that the DPI is still 155 which, with default Windows sizing settings, makes touching the Windows controls quite tricky under desktop. 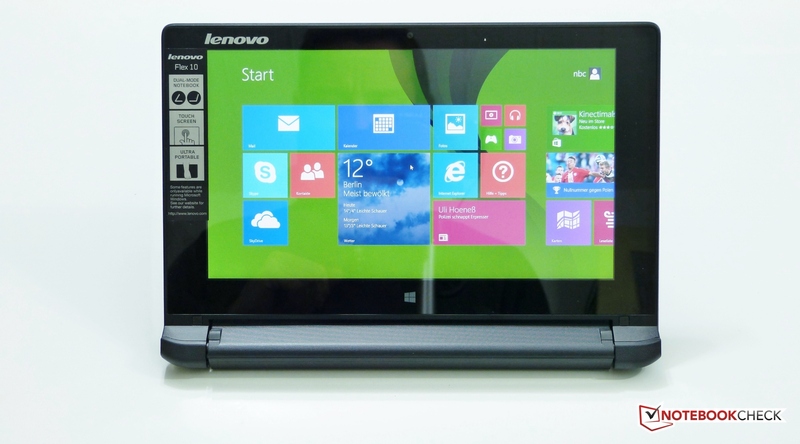 An accurate touchscreen helps and we find the Lenovo Flex 10 module to be OK in this respect. In start-up situations and during heavy use of the disk we noticed that it was possible for touchscreen responsiveness to fail for short periods. 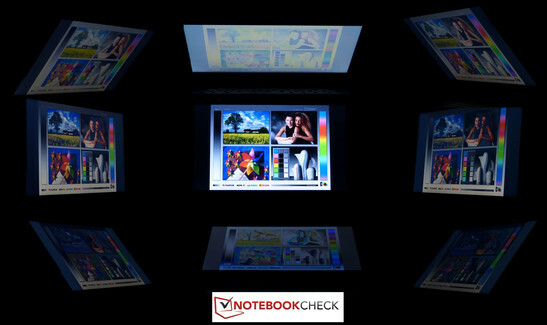 Given that the display can fold back beyond 180 degrees there are three non-standard scenarios to talk about in addition to normal ‘laptop’ usage mode. Firstly you’ve got the useful ability to push the screen back to angles that help with low-level tables where you’re sometimes working from above the unit. You’ve also got a useful flat mode which is perfect for resting the unit on a lap or even your belly in order to read something more at eye level. That works really well on seat-backs too where you can raise the screen up nearer too eye level. 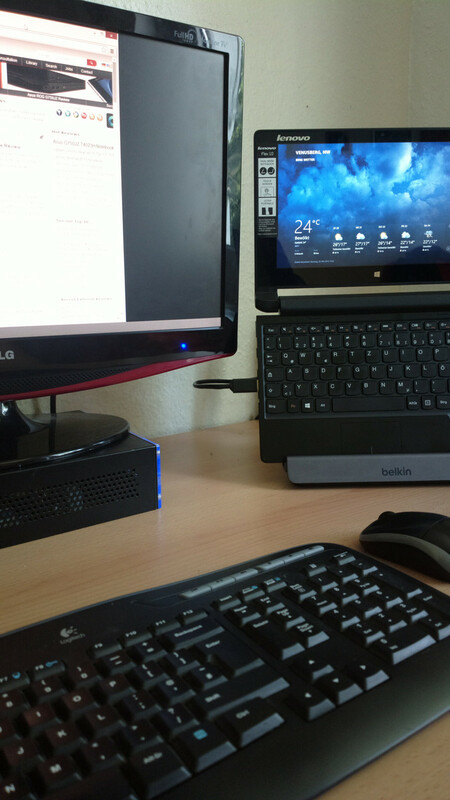 The same principle works if you put the unit in a tablet dock. With a USB DisplayLink dock you get a one-plug docking experience. The USB3.0 interface is a real advantage here. There is also the 'stand' mode and ‘tent’ mode to consider. We can immediately ignore the tent mode as Lenovo haven’t rubberized the edges of the device and don’t support auto-screen rotate so that leaves us with stand-mode with the screen rotated fully back beyond 180-degrees and the unit sitting on it’s keyboard. 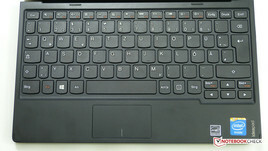 The keyboard is automatically disabled in this mode and the rubber feet provide the friction to keep everything steady for a great Windows 8 ‘Modern’ experience. Music, video and games are fun in this mode but you’ll also find that kids puzzles and educational software are good too. Just don’t let them knock the unit off the table because that spinning hard drive may not survive. Videos (single person due to the narrow screen viewing angles and small size) are nice to experience on a bed, especially as there's no fan noise. We’re thinking of hotels at this point and possibly the only reason you’d want a larger drive - Films. Detailed screen quality testing is shown below but you’ll see that the color and brightness figures really aren't that impressive. Kids won’t care though, unless they’re in the back of the car on a sunny day. In the detailed screen test results you'll see all-round poor results. Brightness, color representation and viewing angles are limited. 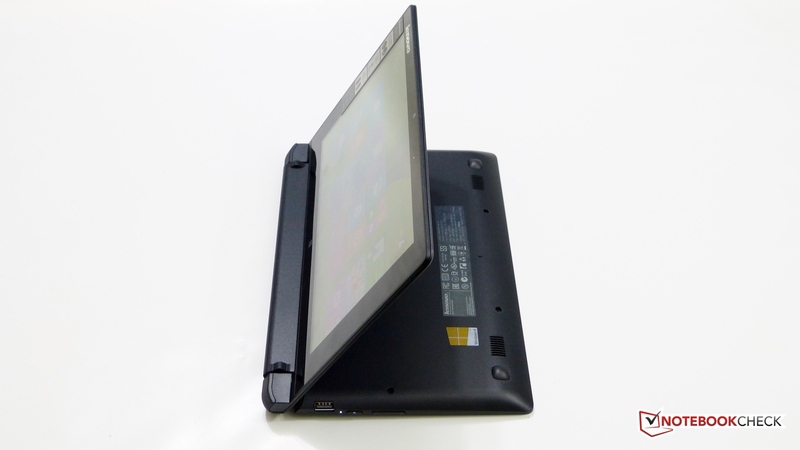 The Lenovo Flex 10 was obviously not designed to offer pro-level screen characteristics but we feel that the viewing angles and brightness should be better. For indoor use with one-person viewing content in a casual fashion this screen is acceptable but we've seen a lot better on Windows 8 notebooks and tablets in the same price category. A detailed viewing angle image is shown below which demonstrates the limitations mentioned above. 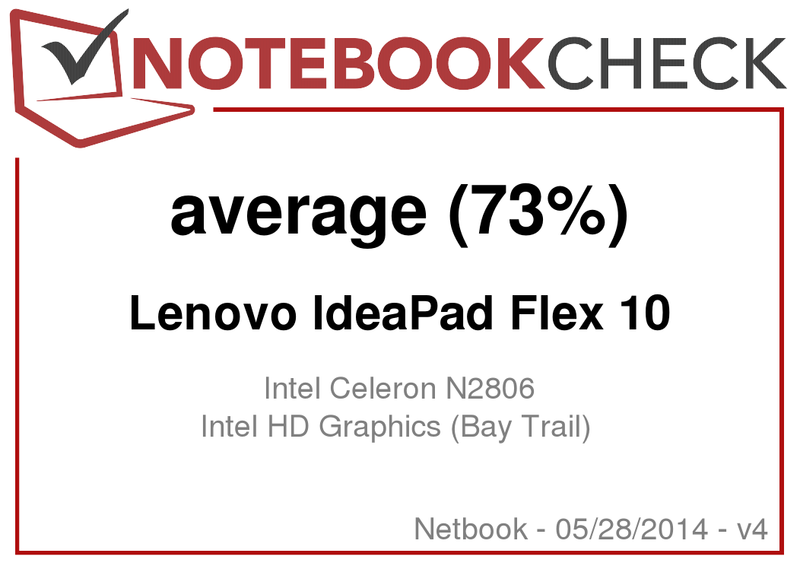 We’ve completed a lot of synthetic benchmarking and you’ll see in the results below that the Lenovo Flex 10 isn’t a high performer but it’s under general usage that you get a feel for where the limits are. It’s soon evident that the hard drive is really slowing the system down. See more detail in the sections below. As mentioned, the video decoding subsystem is hardware-accelerated and very capable. We tested an Openelec build of XBMC and saw smooth operation and good quality playback on all of our test files apart from a very CPU-intensive 10-bit X264-encoded anime file. Remember, this is a fanless laptop and could serve well as an XBMC media center. Cinebench CPU performance doesn't compare well to 4-core Baytrail CPU's or Y-series Core used in the devices shown above. 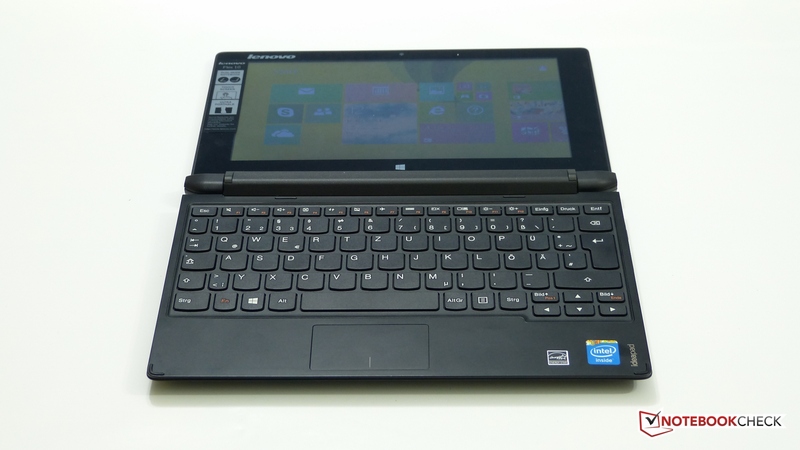 The Toshiba NB10T is a similarly powerful netbook. PCMark 7 shows unimpressive overall results but diving down into the separate tests reveals a lot of it is due to disk performance. Remember we're testing the 320GB disk version here, not the 500GB drive version which may have different performance characteristics. In the CrystalDiskMark results below it's obvious that this is a low-end disk. The poor 4K read and write speeds show themselves in daily use of the system. For example, installing large programs or unpacking large, multi-file ZIP files can be very slow. We noticed some very heavy continuous disk usage during the early part of our testing as Defender, caching, indexing and updates worked their way through. Again, note we're testing the 320GB disk here. The question of an SSD upgrade has been considered but access to the rear of the Flex 10 is limited and likely to result in case damage. For this review we won't be investigating an SSD upgrade further. Consider Windows To Go or a Linux build on a fast USB3.0 SSD if you want to experiment with faster disk access. The comparison above shows how the important 4K write figures (small size write speed that contribute a lot to the smoothness of Windows experiences on low-end devices) vary between cheap hard-drive units and a cheap SSD (eMMC based) on a Windows 8 tablet. While spinning hard drives are much more rugged than they used to be we’re not entirely happy with the combination of a flip-round screen and a spinning hard drive. Such a versatile screen leads the user into thinking it’s a highly dynamic device when in fact the hard drive could suffer if care is not taken. This is one of the biggest concerns we have with the Lenovo Flex 10 build but we’re unable to do long-term testing to see if this is really going to be an issue. On the question of SSD-upgrade, we were unable to easily get the back of the unit off but given that there’s a 2.5-inch SATA drive inside there should be no problem for those prepared to ‘break the seal’, void the warranty and do some dirty work inside. Let us know if you have success with this. The Baytrail Gen-7 on-chip graphics solution was not designed for dektop PC gaming and that's immediately clear when trying to run any sort of desktop game. There's a powerful video decoding function for common video formats but no hardware-assisted hardware encoding via Intel Quick Sync hardware. We attempted to install and run X-Plane but there's a basic problem with the disk speed that means installation and startup-times are too long for large desktop games. This problem affects all types of gaming including even some large Windows 8 Modern games. We found the perfect game in Wordament where CPU and GPU load is minimal but where the touchscreen really comes into its own. Graphic Benchmarks are shown above and if you need more information on the types of games that might be possible on this processing platform (disk speed issues may still impact your ability to load and play games) see the information we have here. A comparison of Cinebench 11.5 OpenGL scores shows that despite the dual-core architecture, the graphics scores are close to that of other Celeron Baytrail 4-core units. The Pentium Baytrail models (e.g. Yoga 2 11) have a higher performing GPU. 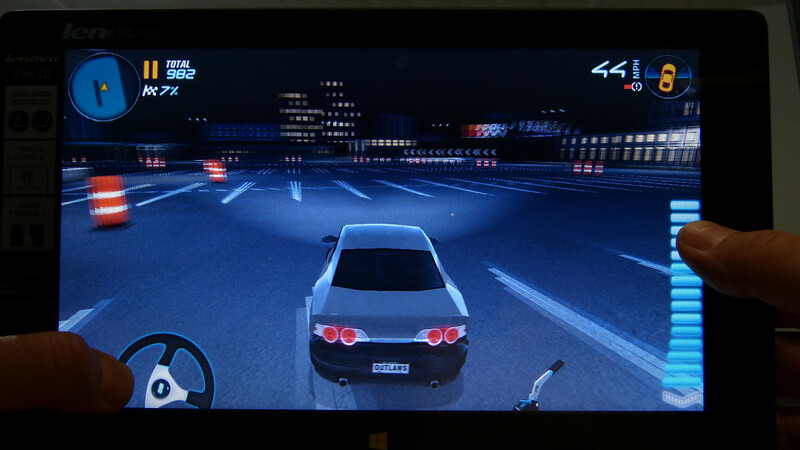 An HD4200 GPU on the Lenovo Yoga 11S with a Y-Series CPU produces about double the OpenGL performance. Test results are below and you'll see that despite the lack of any cooling this laptop isn't bad when it comes to heat. Under mains power while in use you'll detect some warmth towards the top left but it's not worth talking about given the price and silent nature of the Lenovo Flex 10. (±) The average temperature for the upper side under maximal load is 33.3 °C / 92 F, compared to the average of 29.8 °C / 86 F for the devices in the class Netbook. (+) The maximum temperature on the upper side is 36.7 °C / 98 F, compared to the average of 33 °C / 91 F, ranging from 21.6 to 53.2 °C for the class Netbook. (+) In idle usage, the average temperature for the upper side is 29.9 °C / 86 F, compared to the device average of 29.8 °C / 86 F.
Speakers are low quality units with a lack of any bass (as is normal with laptops) and give poor results in comparison with other devices in the category. Full volume results in a very piercing experience. 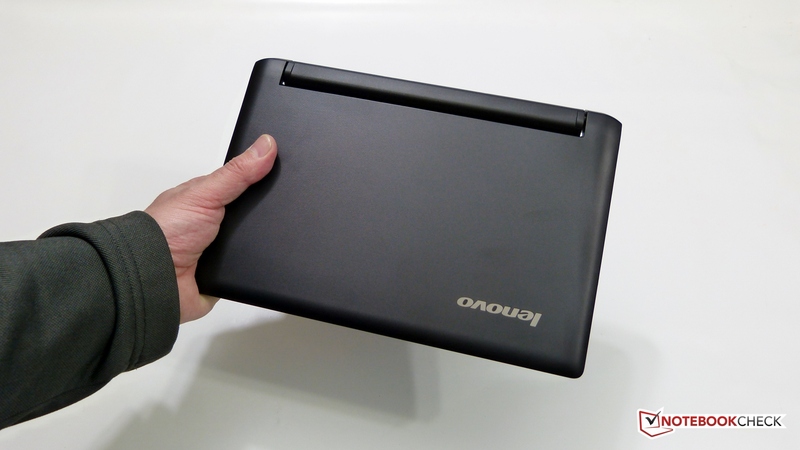 We found the Lenovo Ideapad Flex 10 acceptable for casual YouTube use and although we haven't tested it the speakers are likely to be fine for Skype use. Overall levels of power usage were very low showing that this platform is extremely efficient. Battery runtime figures were acceptable for video and web browsing but because of the small battery are not class-leading. There's enough battery life for a couple of 'airplane mode' films and over 3.5hrs of web browsing - enough to make a good armchair laptop for an evening. Gaming runtime is based on Modern Store game usage. 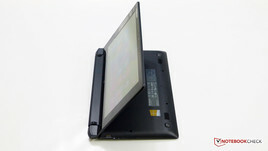 The Lenovo Ideapad Flex 10 is a relatively unique laptop in that it offers a 270-degree fold-back touchscreen in a compact chassis for a relatively low price. Build quality appears to be good the keyboard works well and processing performance is enough to get through some tasks in Windows 8 although multitasking between multiple desktop apps can result in the disk becoming a bottleneck. A small SSD may have been a better choice and would have resulted in much better start-up times and multitasking but the overall CPU and GPU performance is still very low. Back-seat, airplane, hotel, living room are places were the Flex fits and there's even some scope for good quality media playback via external screens and audio equipment via the HDMI digital output. Fan noise won't be an issue! 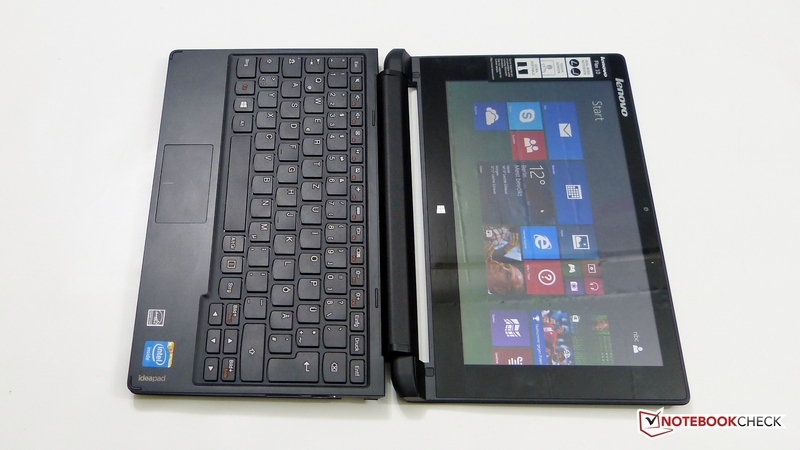 The Lenovo Flex 10 isn't an all-day sub-notebook, not a tablet replacement and certainly not a professionals laptop. The screen quality is as poor as the disk, battery life is average and the processing level is just enough for some basic-but-smooth Windows 8 usage but we found it acceptable for short periods of desktop use, very interesting as a touchscreen in stand mode with the Modern UI and useful for video playback. It's fanless too which makes it interesting as a potential HTPC. Our XBMC/Openelec test proved there's no problem there. 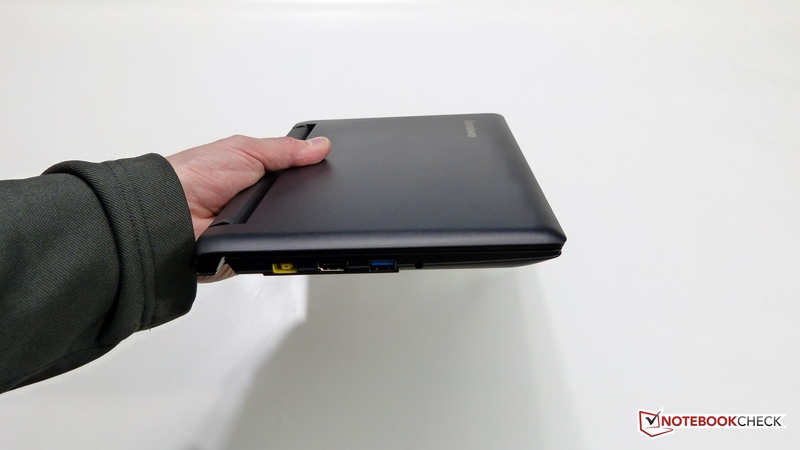 The Lenovo Ideapad Flex 10 will appeal as a second device and might even win back a few users looking at tablets. Pricing (at current street prices) is acceptable but do look out for $299 offers which we think are on the horizon. Yes, you can get a lot more processing power for your money - Chromebooks are the very obvious example - but this is a low-cost, fanless 2-in-1 touchscreen netbook and that puts it in a unique place. 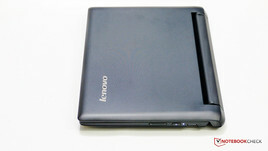 In Review: Lenovo Flex 10. Review sample courtesy of Notebooksbilliger.de. It's compact and easy to type on and the stand mode is truly useful. We'd like to see an IPS screen and a small, but fast, SSD option. The Flex 10 has little competition in its price bracket due to the lack of similar 270-degree folding screens. The HP Pavilion 11-n070eg x360 is worth taking a look at though if you're thinking about a low-cost, compact multi-mode laptop.